The human nervous system is estimated to consist of roughly 360 billion non-neural glial cells and 90 billion nerve cells. Furthermore, there are hundreds of different types of neurons based on morphology alone. Often, neurons that look similar have strikingly different properties. For example, they utilize and respond to different neurotransmitter(s). This section reviews the cellular components of nervous tissue. Students should be able to describe neurons and glia, their morphological components as seen with the light and electron microscope, and some of the fundamental functional roles these cell types play in the nervous system. Click on the parts of the Model Neuron to view structures. After reviewing the Model Neuron above, learn more about the function of each structure by clicking from the list below. 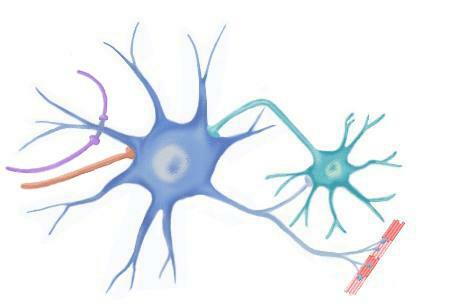 Click the identified structures on the model neuron to move to the related section. The region of the neuron containing the nucleus is known as the cell body, soma, or perikaryon (Figure 8.2). The cell body is the metabolic center of the neuron. The interior of the soma consists of cytoplasm, a gel within a microtrabecular lattice formed by the microtubules and associated proteins that make up the cytoskeleton. Energy producing metabolism and the synthesis of the macromolecules used by the cell to maintain its structure and execute its function are the principal activities of the neuronal soma. As described in Chapter 6, it also acts as a receptive area for synaptic inputs from other cells. Embedded within the neuronal cytoplasm are the organelles common to other cells, the nucleus, nucleolus, endoplasmic reticulum, Golgi apparatus, mitochondria, ribosomes, lysosomes, endosomes, and peroxisomes. Many of these cell inclusions are responsible for the expression of genetic information controlling the synthesis of cellular proteins involved in energy production, growth, and replacement of materials lost by attrition. 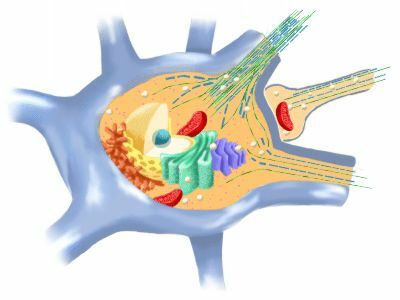 Diagrammatic representation of the neuron cell body or perikaryon emphasizing the endoplasmic reticulum, Golgi apparatus and cytoskeleton. Place cursor over image to identify organelles. The membrane of the neuron functions as a receptive surface over its entire extent; however, specific inputs (termed afferents) from other cells are received primarily on the surface of the cell body and on the surface of the specialized processes known as dendrites. The dendritic processes may branch extensively and are often covered with projections known as dendritic spines. Spines provide a tremendous increase in the surface area available for synaptic contacts. The dendritic processes and spines of neurons are essentially expansions of cytoplasm containing most of the organelles found in the cell body. Dendrites contain numerous orderly arrays of microtubules and fewer neurofilaments (see below). The microtubule associated proteins (MAPs) in the dendrite have a higher molecular weight than those found in the axon. An example is MAP2. In addition, microtubules in dendrites have their positive ends toward the cell soma. Mitochondria are often arranged longitudinally. Rough endoplasmic reticulum and ribosomes are present in large but not small dendrites. The shape and extent of the "dendritic tree" of an individual neuron is indicative of the quantity and variety of information received and processed by that neuron. The dendritic spines often contain microfilaments which is the cytoskeletal element responsible for changes in spine shape observed in some examples of synaptic plasticity. Diagrammatic representation of the neuron dendrite, emphasizing the areas of contact by other afferent inputs to the neuron. Information is received by the dendrite through an array of receptors on dendrite surface that react to transmitters released from the axon terminals of other neurons. Dendrites may consist of a single twig-like extension from the soma or a multi-branched network capable of receiving inputs from thousands of other cells. For instance, an average spinal motor neuron with a moderate-sized dendritic tree, receives 10,000 contacts, with 2,000 of these on the soma and 8,000 on the dendrites. The cone-shaped region of the cell body where the axon originates is termed the axon hillock. This area is free of ribosomes and most other cell organelles, with the exception of cytoskeletal elements and organelles that are being transported down the axon. The neurofilaments in the axon hillock become clustered together as fascicles. The region between the axon hillock and the beginning of the myelin sheath is known as the initial segment. In many cases, this region is the anatomical location for the initiation of the action potential. The area under the axolemma in this region has material that stains darkly when viewed by EM. This region is shown in Figure 8.4. At the distal-most end of the axon and its collaterales are small branches whose tips are button-shaped cytoplasmic enlargements called terminal boutons or nerve endings. Diagrammatic representation of the initial segment of a neuron, emphasizing the areas in which the action potential is initiated. The other type of process in the idealized neuron is the axon. 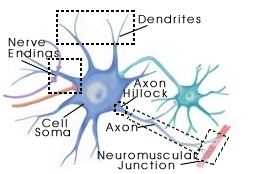 Each neuron has only one axon and it is usually straighter and smoother than the dendritic profiles. Axons also contain bundles of microtubules and neurofilaments and scattered mitochondria. The most MAPs in an axon have a lower molecular weight than those in the dendrite. A predominant MAP in axons is tau. Microfilaments within the axon are usually associated with an area adjacent to the plasmalemma and often are the most dense at the nodes of Ranvier. Beyond the initial segments, the axoplasm lacks rough endoplasmic reticulum and free ribosomes. The branches of axons are known as axon collaterales. The axon itself is often surrounded by a membranous material, called the myelin sheath, formed by glia cells. The myelin sheath acts to insulate the plasmalemma of the axon in a way that necessitates the more rapid spread of the depolarization of the plasmalemma and increases the speed of conduction of the nerve impulse (see Chapter 3). Diagrammatic representation of the axon emphasizing the areas of microtubules, neurofilaments coursing within the cytoplasm. The part of the plasma membrane of the nerve ending that is specialized to form functional contacts with other cells is the synapse. Diagrammatic representation of an excitatory synapse, showing the spherical vesicles and the presynaptic density. View an EM of a nerve ending with spherical vesicles. When neurons interact with muscle fibers, the region of functional contact is called the neuromuscular junction or motor endplate (Chapter 4). According to the classical definition of synapse, when a nerve ending synapses on a dendrite or soma of a second neuron it is termed either an axodendritic or an axosomatic synapse, respectively (Chapter 7). However, almost all possible combinations of pre- and postsynaptic elements have been found in the central nervous system. These different types of synapse are designated by combining the name of the structure of the presynaptic element with that of the postsynaptic structure. For example, when the transfer of information occurs from an axon to axon or from one terminal to another, the synapse involved is called an axoaxonic synapse. View an EM of a nerve ending with flat vesicles. A presynaptic complement of membrane-bound synaptic vesicles exists. These are spherical vesicles in excitatory nerve endings, shown in Figure 8.6. In inhibitory neurons the synaptic vesicle are often flattened as shown in Figure 8.7. The nerve ending often has aggregations of dense material in the cytoplasm immediately adjacent to the membrane on the pre- and postsynaptic side of the junction (these are known as presynaptic density or postsynaptic density, respectively.) This dense material on the presynaptic side is thought to be the site of vesicle attachment. The dense material on the postsynaptic side is a site where receptor proteins and channels are prevalent. There is a distinct synaptic cleft or intercellular space of approximately 20-40 nm. An endoplasmic reticulum is present that regulates Ca2+ level. Endosomal membrane that functions in the recycling of synaptic vesicles. Numerous variations of the "model" neuron described above exist. An important modification, which occurs especially in receptor neurons, involves the designation of a neuronal process as a dendrite or as an axon. Classically, the axon has been identified as the myelinated or unmyelinated process that transmits signals away from the cell body. The classical view of the dendrite is that of an unmyelinated tube of cytoplasm which carries information toward the cell body. However, this distinction does not hold for ALL neurons. Some cells have a myelinated process that transmits signals toward the cell body. Morphologically the "dendrite" and the "axon" may, therefore, be indistinguishable. Neither the position of the cell body nor the presence or absence of myelin is always a useful criterion for understanding the orientation of the neuron. The region of impulse initiation is more reliable guide to understanding the functional focal point of the cell. This region is analogous to the initial segment of the model neuron, discussed above. Routinely the fiber or process, which contains the initial segment or trigger zone, is referred to as an axon. Note, as shown in Figure 8.8, the trigger zone does not have to be immediately adjacent to the cell body. A number of conventions have evolved to classify and name neurons. One of the oldest, devised by Golgi in the late 1800’s, is based on the complexity of the dendritic tree of the neuron. Through this approach cells are classified as unipolar, bipolar and multipolar neurons as shown in Figure 8.8. Unipolar cells have only one cell process, and are primarily found in invertebrates. However, vertebrate sensory neurons are another form of this type of cell. Because these cells start out developmentally as bipolar neurons and then become unipolar as they mature, they are called pseudo-unipolar cells. Bipolar cells are present in the retina and the olfactory bulb. Multipolar cells make up the remainder of neuronal types and are, consequently, the most numerous type. These have been further sub-categorized into Golgi type II cells that are small neurons, usually interneurons, and Golgi type I cells that are large multipolar neurons. Cells are also named for their shape (e.g., pyramidal cells shown in Figure 8.9) or for the person who first described them (e.g., Purkinje cells shown in Figure 8.10). More recently, cells have been named for their function or the neurotransmitter they contain (e.g., CNS norepinephrine cell groups covered in Chapter 12). This description is possible because of the development of histochemical and immunocytochemical methods to specifically identify the neurotransmitter type used by neurons. Two variations in cell morphology. On the left is the pyramidal cell named for its characteristic pyramid shape. This cell is prominent in the cerebral cortex. On the right is the cell soma and dendrites of the Purkinje cell found in the cerebellum and named for the scientist, Purkinje. Many of the terms used in this section are defined below. Axolemma is the plasmalemma of the axon. Endoplasmic reticulum is a labyrinthine, membrane bounded compartment in the cytoplasm where lipids are synthesized and membrane bound proteins are made. In some regions of the neuron ER is devoid of ribosomes and is termed smooth ER. The smooth ER is involved in Ca2+ buffering and in the biosynthesis and recycling of synaptic vesicles as will be discussed in Chapter 10. Endosome is a membrane-bounded organelle that carries materials ingested by endocytosis and passes them to lysosomes and peroxisomes for degradation. It also functions in the nerve ending to recycle synaptic vesicles. Golgi apparatus is a collection of stacked, smooth-surfaced membrane bound organelles where proteins and lipids made in the endoplasmic reticulum are modified and sorted. Lysosomes contain enzymes that digest compounds that originate inside or outside the cells. They are involved in converting proteins to amino acids and glycogen to glucose, the basic nutrient of neurons. Their enzymes act at an acidic pH. As will be described later, they also serve as vesicles for reverse transport from axon terminals to the soma. Many lysosomes become degraded to lipofuscin granules, which accumulate as the organism ages and are regarded as neuronal refuse. Lysosomes form from the budding off the Golgi apparatus. They have a variety of membrane-bound shapes and sizes, ranging in size between 250 and 700 nm in diameter. Microfilaments are 7 nm in diameter filaments arranged as a paired helix of two strands of globular actin. Microfilaments are especially prominent in synaptic terminals, in dendritic spines, and in association with the axolemma. Microtubules are 20 to 25 nm diameter tubular structures that run in loose bundles around the nucleus and funnel into the base of the axonal and dendritic processes where they form parallel arrays distributed longitudinally. They are made up of dimers of α and β tubulin subunits and contain associated proteins known as microtubule associated proteins (MAPS). The MAPS regulate the polymerization of tubulin subunits to form the microtubules. The dimers of α and β tubulin subunits polymerize to form proto-filaments arranged in an a helix such that 13 dimer subunits make up each full turn of the a helix. In addition, microtubules are not continuous, and each microtubule is composed of numerous 100 nm units. Microtubules are involved in axoplasmic transport (see below). Mitochondria are distributed ubiquitously throughout the cytoplasm of the entire nerve cell and are especially plentiful at presynaptic specializations. Neurofilaments are a type of intermediate filament found in nerve cells. Neurofilaments are involved in the maintenance of the neuron's shape and mechanical strength. Although neuronal neurofilaments are classified as intermediate filaments, their composition in neurons is different than that found in other cells. They are composed of three subunits that are arranged to form a 10-nm diameter tubule. It is the neurofilament that stains with heavy metal to permit the visualization of neuronal shape. Neurofilaments run in loose bundles around the cell nucleus and other organelles and funnel into the base of the axonal and dendritic processes where they form parallel arrays distributed longitudinally. Neurofilaments are more abundant than microtubules in axons, whereas microtubules are more abundant than neurofilaments in dendrites. It is the neurofilaments that undergo modification in the Alzheimer's disease to form neurofibrillary tangles. Nucleolus is in the center of the nuclei of all neurons. It is a prominent, deeply stained spherical inclusion about one-third the size of the nucleus. The nucleolus synthesizes ribosomal RNA, which has a major role in protein synthesis. Nucleus of the neuron is large and round and is usually centrally located. In some cells, masses of deeply staining chromatin are visible in the nucleus. The nuclear membrane of neurons is like that of other cells - a double membrane punctuated by pores (nuclear pores) which are involved in nuclear-cytoplasmic interactions. The nucleus in neurons is spherical and ranges in diameter from 3 to 18 micrometers depending on the size of the neuron. Neurons with long axons have a larger cell body and nucleus. As in other cells, the principal component of the nucleus is deoxyribonucleic acid (DNA), the substance of the chromosomes and genes. Peroxisomes are small membrane bounded organelles that use molecular oxygen to oxidize organic molecules. They contain some enzymes that either produce or degrade hydrogen peroxide. Plasmalemma of the neuron appears in the electron microscope as a typical bi-layered cellular membrane, approximately 10 nm thick. Postsynaptic density is darkly staining material of postsynaptic cell adjacent to the synapse. Receptors, ion channels, and other signaling molecules are likely bound to this material. Presynaptic density is the region of darkly staining material of the presynaptic membrane where synaptic vesicles are hypothesized to dock prior to fusion with the presynaptic membrane. Ribosomes are particles composed of ribosomal RNA and ribosomal protein which associate with mRNA and catalyze the synthesis of proteins. When ribosomes are attached to the outer membranes of the ER, the organelle is termed rough ER. The rough ER, in laminae with interspersed ribosomes, is visible with the light microscope as Nissl substance. In light microscopic preparations, the appearance of Nissl substance varies in different types of neurons. It may appear as densely stained ovoids or as finely dispersed particles or aggregations of granules. Synapse is the junction that allows signals to pass from a nerve cell to another cell or from one nerve cell to a muscle cell. The synaptic cleft is the gap between the membrane of the pre- and postsynaptic cell. In a chemical synapse the signal is carried by a diffusable neurotransmitter. The cleft between the presynaptic cell and the postsynaptic cells is 20 to 40 nm wide and may appear clear or striated. Recent studies have indicated that the cleft is not an empty space per se, but is filled with carbohydrate-containing material. Synaptic vesicles are small spherical organelles in the cytoplasm of neurons that contain neurotransmitter and various proteins necessary for neurotransmitter secretion. Vesicles containing inhibitory neurotransmitter are often flat or elliptical whereas vesicles that contain excitatory neurotransmitter are usually more spherical. Types of neuroglia. Click on the different glial cells to view the details of their structure and function. The most numerous cellular constituents of the central nervous system are the non-neuronal, neuroglial ("nerve glue") cells that occupy the space between neurons. It has been estimated that there are roughly 360 billion glial cells, which comprise 80-90% of the cells in the CNS. This section will cover the general classifications of the neuroglial cells and describe some of the general properties that distinguish neuroglia from neurons. are less electrically excitable than neurons. Neuroglia are classified based on size and shape fo their neucleus and distinguished from neurons, at the light microscopic level. Alkaline (basic) dyes are used to show nuclear morphology. In addition, several metal stains are used show the shape of the cell and cytoplasmic architecture. Characteristics of nuclei, including size, shape, staining intensity, and distribution of chromatin, are used to distinguish cell types in pathological material. Cell body characteristics, including size, shape, location, branching pattern, and density of processes, are also used. Neuroglia are divided into two major categories based on size, the macroglia and the microglia. The macroglia are of ectodermal origin and consist of astrocytes, oligodendrocytes and ependymal cells. Microglia cells are probably of mesodermal origin. A comparison of the various neuroglial types is shown in Figure 8.11. Click on a glial cell to move to the related section. 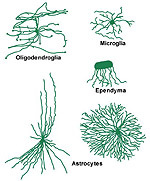 There are three types of macroglia: Oligodendroglia, Ependyma, and Astrocytes. This section discusses the two types of astrocytes: Protoplasmic and Fibrous. Protoplasmic astrocytes are found primarily in gray matter. With silver or glial specific stains, their cell bodies and processes are very irregular. The processes may be large or very fine, sometimes forming sheets that run between axons and dendrites, and may even surround synapses. These fine sheet-like processes give the protoplasmic astrocyte cell body a "fuzzy" or murky appearance under the light microscope. Bundles of fine fibrils may be seen within the cytoplasm. The nucleus of a protoplasmic astrocyte is ellipsoid or bean-shaped with characteristic flecks of chromatin. Specific types of intercellular junctions have been noted between the processes of protoplasmic astrocytes. These probably mediate ion exchange between cells. Fibrous astrocytes are found primarily in white matter, have a smoother cell body contour than do protoplasmic astrocytes as seen with glial-specific stains, and have processes that tend to emerge from the cell body radially. These processes are narrower and branch to form end feet on blood vessels, ependyma, and pia. Consequently, the processes of fibrous astrocytes do not form sheets and do not tend to conform to the shape of the surrounding neurons or vascular elements. The major distinguishing feature of fibrous astrocytes, as the name suggests, is an abundance of glial fibrils arranged in parallel arrays in the cytoplasm and extending into the processes. In Nissl stains, the fibrous astrocytes have a nucleus essentially the same as that of the protoplasmic type with a flecked appearance. Intercellular adherences have also been observed between fibrous astrocytes. Astrocyte with end feed projecting to the surface of neurons, blood vessels, ependyma and the meninges. No single astrocyte would project to all of these structures. Both types of astrocytes function to support the neurons in their immediate vicinity. They provide a physical barrier between cells, maintain the ionic and pH equilibrium of the extracellular space around neurons, and continually modify the chemical environment of the neighboring cells. As shown in Figure 8.14, astrocytes form a complete lining around the external surface of the CNS (glial limitans) and around blood vessels (perivascular feet). During development, they form scaffolding along which nerve cells migrate to achieve their mature structure. During injury, the astrocytes proliferate and phagocytize dead cells. This often leads to the formation of glial scar. In addition to these general functions, astrocytes also act in more specialized ways to facilitate neuron function. They metabolize neurotransmitters by removing them from the synaptic cleft. For example, the amino acid glutamate is taken up by astrocytes and inactivated by conversion to glutamine. Glutamine is then transported to the neuron to be re-synthesized into glutamate (see Chapter 13). More recent evidence indicates that the astrocytes can dramatically change size as part of their physiological regulation of the neuronal environment. These functions will be discussed in later sections. Oligodendrocytes are also located in both gray and white matter. They are the predominant cell type in white matter where they are often located as rows of cells between groups of neuronal processes. These are termed interfascicular oligodendroglia and are involved in the formation and maintenance of the myelin surrounding the neuronal processes nearby. In gray matter, oligodendroglia are usually located near neurons and, therefore, are known as perineuronal satellite cells. Cell bodies of oligodendroglia are often located near capillaries, but they lack the definite perivascular end feet characteristic of astrocytes. The processes of oligodendrocytes are fewer and more delicate than astrocytes, and the cell body shape is polygonal to spherical. The oligodendrocyte nucleus is smaller than that of the astrocyte, is eccentrically located in the cell body, contains clumps of chromatin and can be stained by alkaline dyes. The cytoplasm of oligodendrocytes tends to be darker than that of astrocytes with silver stains, and does not contain glial fibrils (although they do contain microtubules). Diagram showing one oligodendrocyte myelinating several internodal regions. The role of oligodendroglia in the central nervous system, particularly of the interfascicular oligodendrocytes, is the formation and maintenance of myelin. Myelin is the sleeve of membranous material described by Dr. Byrne, that wraps the neuronal axon as shown in Figure 8.15 to facilitate the conduction of the action potential through saltatory conduction. Myelin is composed of concentric layers of membranes compacted against one another with an internal (i.e. against the nerve fiber) and an external collar of cytoplasm. As shown in Figure 8.15, a single oligodendrocyte contributes to the myelination of several adjacent nerve processes. Moreover, more than one oligodendrocyte contributes to the myelination of a single internode of an axon. The lamellae of myelin membranes result from the spiral wrapping of the axon by cytoplasmic processes of interfascicular oligodendroglia. Also, the oligodendrocyte forming a particular myelin internode (i.e. the myelin between two nodes) is seldom seen directly adjacent to the myelin-wrapped process. This is because thin cytoplasmic bridges connect the region of the oligodendrocyte cell body to the external wrap of myelin. It is important to note that the region of the axon exposed at the node of Ranvier is not bare. It may be the site of branching of the axon, the site of synaptic contacts, or it may be covered with various glial processes. The axon in the nodal region usually contains concentrations of organelles, especially mitochondria. In the Peripheral Nervous System (PNS), Schwann cells are responsible for the myelin formation. These cells myelinate axons differently than the interfascicular oligodendroglia. As shown in Figure 8.16, they migrate around the axon, laying a membrane covering around the axon by squeezing out the cytoplasm of the Schwann cell. Also, every internode of a PNS axon represents a single Schwann cell. In addition unmyelinated axons in the PNS are also enclosed by membranes formed by Schwann cells. Diagrammatic representation of how single Schwann cells myelinate each internodal region. View a Schwann cell EM. Ependymal cells are derived from the early germinal epithelium lining the lumen of the neural tube and thus are also ectodermal derivatives (along with neurons, astrocytes, and oligodendrocytes). Ependymal cells line the ventricles of the brain and the central canal of the spinal cord. They are arranged in a single-layered columnar epithelium, and have many of the histological characteristics of simple epithelium, which vary from squamous to cuboidal depending upon their location. The ependyma forming the ventricular lining do not connect to a basal lamina, but rest directly upon underlying nervous tissue. As shown in Figure 8.17, the surface facing the ventricle contains many microvilli and cilia. These cilia move cerebrospinal fluid (CSF) in the ventricles. The lateral borders of the ependymal cells are relatively straight and form junctions with adjacent cells. Ependymal cells are modified in various regions of the ventricles into layers of cuboidal epithelium, which do lie on a basement membrane (formed by an outgrowth of the pia) over a rich bed of vasculature and connective tissue. This is the choroid plexus studied in the Laboratory that is responsible for the secretion, uptake and transport of substances to and from the CSF. Diagrammatic representation of the arrangement of ependymal cells to formt he ciliated lining of the ventricles. Microglia, in contrast to the other types of glial cells, originate from embryonic mesoderm. They are present throughout the central nervous system, but tend to be inconspicuous in mature normal tissue and are difficult to identify with the light or electron microscope. They are more abundant in gray matter, and may compromise up to 5-10% of the neuroglia in the cerebral cortex. 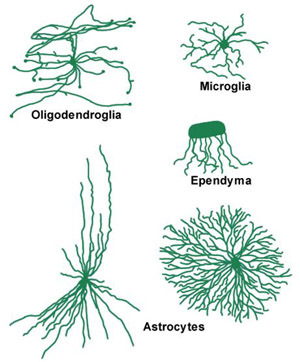 The general appearance of microglia is similar to oligodendrocytes, although they are smaller and have undulating processes with spine-like projections. Microglial nuclei are elongated or triangular and stain deeply with alkaline dyes. Following damage to nervous tissue, microglia proliferate and migrate to the site of injury where they clear cellular debris by phagocytosis. The reacting microglia have a swollen form with shortened processes and are difficult to discriminate from phagocytes from the periphery or migrating perivascular cells. It is estimated that at least one third of the phagocytes appearing in the area of a lesion are of CNS origin. A. Neurons This answer is INCORRECT. Although it is currently controversial, the preponderance of evidence indicates that neurons do not undergo cell division once they have matured during the development of the organism. B. Microglia This answer is CORRECT! Microglia both divide and migrate into regions of cellular injury within the central nervous system in response to injury. C. Fibrous astrocytes This answer is CORRECT! Both fibrous and protoplasmic astrocytes undergo cell division in response to injury. D. Protoplasmic astrocytes This answer is CORRECT! E. Macrophages This answer is CORRECT! Macrophages appear in the CNS following injury and work together with the CNS glial cells to phagocytize CNS debris. A. Microglia This answer is INCORRECT. B. Fibrous astrocytes This answer is CORRECT! C. Protoplasmic astrocytes This answer is CORRECT! D. Ependymal cells This answer is INCORRECT. E. Macrophages This answer is INCORRECT.